We carry one of the best selections of professional hair scissors and shears from Kamisori, Bonika, Joewell, Kasho, and Kretzer. You can browse our store to find texturizing / thinning shears, left handed scissors, barber scissors, ergonomic scissors, and hair shear sets. The hair styling artist wouldn't be a true artist without the right hair cutting tools. Having a pair of hair cutting scissors in your hand that fit comfortably and feel like an extension of your hand is key to creating the perfect hair style for your clients. Every hair dresser or barber needs a set of hair shears that will allow you to perform on a professional level for many years to come. A pair of thinning shears or a texturizer for removing bulk and a staight shear for point cutting is recommended for your hair supply tool kit. For ultimate comfort, a pair of offset handle, ergonomic shears will provide many hours of smooth cutting without wrist and shoulder strain. Many hair stylists make the mistake of not investing in the proper equipment. This results in shears having to be replaced more often and strain on the shoulders and carpal tunnel in the wrists from repetitive hair cuts. No matter how capable you are, the wrong set of hair cutting scissors will be make it difficult to give your clients that perfect cut every time. Every person who leaves your shop should be a walking advertisement of your skills. You want people to ask your clients where they go for their hair, as this is the fastest means of seeing new clients fast. Investing in a sharp pair of shears that are made from high quality steel and a good tensioning system to help keep the blades precise is a necessity for your business. We recommend the offset handle design to lessen strain from long work hours. The offset handle is designed for you to hold the shears in a more natural position with your elbows down preventing fatique that is often associated with keeping your shoulders hunched up and your wrists in the wrong angle relative to the handle of the shears. Every salon and stylist will specialize in certain cuts. In a typical area, you will see many people who are interested in a certain look. A good pair of hair cutting scissors should be up to the task and designed to make the styles you are specializing in easier. The length of the blades, the sharpness, and the handle types, all impact the style of cutting. That's why we've listed a few of the recommended hair cutting techniques that a particular pair of shears are designed for with each shear. Ultimately your hair cutting kit will include multiple types of shears of various lengths, blade widths and types, handle types, finishes, and designs to allow you to have what you need at all times. Many hair cutting scissors, such as Kamisori scissors, have a unique look. They are high-end Japanese steel hair cutting scissors saught after by many high-end professional hair-stylists for their fine construction and unique designs. They'll often become conversation pieces with your clients. The added benefit is that professionally designed hair scissors like Kamisori are ergonomically designed to have lower weight and better balance so stylists will have less trouble holding them for long periods of time. You can have the style without sacrificing the benefts of a fine pair of hair shears. 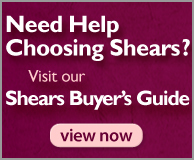 For the best prices, it is always to best to purchase shears in a set. This offers a savings in buying multiple shears at once while giving you the 2 basic tools you need: a thinning shear and a straight or offset shear. The right professional hair cutting scissors should be built to last. Many hair dressers who have invested in a high quality pair of shears when they started cutting hair have used the same shears for decades. This is only possible with a high quality brand and maintaining the shears with extra special care. Your investment in a high quality pair of hair shears should last you 15-20 years. Your professional hair cutting scissors should be stored in a cool, dry, and safe place. Most purchases include a free case and maintenance kit. If one is not provided or if you're looking for one that can carry multiple shears, take a look at the shear cases that we offer. Humidity, dust, chemicals or cosmetics can potentially damage your shears. The longer you maintain your shears properly, tthe longer they will stay sharp and cut smoothly and easily. Depending on the quality of the steel and the maintenance routine, shears may need sharpening once a year or once every 2-5 years. The best way to keep your shears sharp is to maintain a good tension. Tensioning that is too loose will make the hair fold. Tensioning that is too tight may change the angle of the blade's cut. The shears when open should be tight enough that they don't fall easily down, but loose enough that if you touch the handle, they close. Often hair stylists think their shears need to be sharpened when the only thing needed is quick tensioning fix. Tossing scissors in a drawer along with other tools or scissors is a bad habit as this can damage their look and effectiveness quickly. Kamisori HE-3L Lefty Jewel Shears 5.5"
Kamisori HE-3L Lefty Jewel Shears 5.0"
Kamisori K-7L Left-Handed Revolver Shears 5.5"
Kamisori K-7L Left-Handed Revolver Shears 6.5"
Kamisori T-1L Left-Handed Tsunami Shears 5.5"
Kamisori T-1L Left-Handed Tsunami Shears - 6.0"
Kamisori DM-3L Smoke Lefty Shears 5.5"
Kamisori DM-3L Smoke Lefty Shears 6.0"
Kamisori D-1L Diablo Lefty Shears 5.5"